The best time to see the 2017 Eta Aquarid meteor shower may be in the early morning hours on May 6. 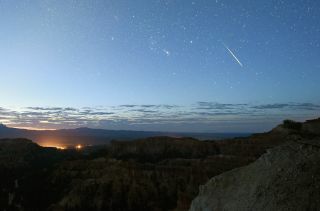 Shown here, a Perseid meteor near Bryce Canyon. Herschel immediately noted that Tupman's observations were very close to his prediction. In the years that followed, increasing numbers of other astronomers and observers also noted similarities between the orbits of Halley's comet and the Eta Aquarid stream. In fact, we now know that Halley also gives rise to another noteworthy meteor shower in late October known as the Orionids. Like other comets, Halley's is a cosmic litterbug; about every three-quarters of a century as it sweeps closest to the sun, it leaves a "river of rubble" in its wake along its orbit. When the Earth interacts with that rubble river, those comet bits race through our atmosphere at high speeds to produce the effect of "shooting stars." The material that the comet releases into space on its way in toward the sun produces the October Orionids, while the material that is released after the comet has rounded the sun and is heading back to the outer limits of the solar system produces the Eta Aquarids. In their book "Observe Meteors" (Astronomical League, 1986) David Levy and Stephen Edberg refer to the Eta Aquarids as "A May flower." They write: "These meteors appear as fast streaks (average speed, 41 miles [per second] or 66 [kilometers per second]). The brightest leave long-lasting trains. Since they are on the outbound leg of their orbits, these meteors arrive mainly in daylight; thus the nighttime observation interval is short and occurs just before dawn." Because these meteors appear to radiate from a position low on the eastern horizon for midnorthern latitudes, watchers in the tropics are best-placed. Under the most favorable conditions, a dozen or more meteors per hour can be seen from the Eta Aquarid swarm. Observers from midnorthern latitudes may only see about half as many. For most, perhaps the best hope for seeing the Eta Aquarids is if you chanced to catch a glimpse of a meteor as it grazed our atmosphere horizontally — much the same way as a flat rock can be made to skim across the top of a lake or pond. Assiduous meteor observers refer to such meteors as "Earthgrazers," and they have a propensity to produce rather colorful and long-lasting trails. Such meteors produce unusually long paths and more often than not appear rather low to the horizon. Unfortunately, they also tend to be few and far between. But if you happen to catch sight of just one, it will make your efforts worthwhile. If you do catch sight of one in the next few mornings, keep in mind that you'll likely be seeing an incandescent streak of light produced by material that originated from the nucleus of Halley's comet. The last time Halley swept through the inner solar system was in 1986 (it’s due back in the summer of 2061), but it has traveled around the sun countless numbers of times over the centuries, each time leaving behind dust and grit similar in consistency and texture to cigar ash or copier toner — debris that astronomers believe dates back nearly five billion years to the birth of the solar system; primordial material that happens to intersect the orbit of Earth about this time in early May every year. So it is that the shooting stars that we have come to call the Eta Aquarids are really an encounter with the traces of a famous visitor from the depths of space, and quite possibly the dawn of creation. If bad weather prevents your view, you can watch a series of Eta Aquarid meteor shower webcasts on Slooh.com at 11 a.m. EDT (1500 GMT), 5 p.m. EDT (2100 GMT) and 11 p.m. EDT (0300 GMT). The first webcast will feature a live views of the meteor shower from New Zealand from Slooh partners Weathernews Japan. The 5 p.m. EDT webcast will include views from Slooh's flagship observatory at the Institute of Astrophysics of the Canary Islands, as well as from partners in Chile and elswhere. The final webcast will be a live show hosted by Gerard Monteux and featuring contributions from Slooh astronomer Eric Edelman, astronomy journalist and author Bob Berman, and Helen Avery, Slooh's human spirit editor. Editor's note: If you snap a great photo of the Eta Aquarid meteor shower and would like to share it with Space.com for a story or photo gallery, send in images and comments to: spacephotos@space.com.